This book isn’t about what you think it is. I’ve always loved the element of surprise, but it wasn’t until reading this charming book that I fully understood why–and how to bring more of it into my life and the world. 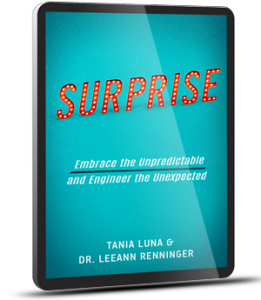 Surprise is a fascinating look at how we can handle and harness surprise in our work, relationships, and everyday lives. Through colorful narratives and compelling scientific findings, authors Tania Luna and Dr. LeeAnn Renninger shine a light on the world’s least understood and most intriguing emotion. They reveal how shifting our perception of surprise lets us thrive in the face of uncertainty. And they show us how surprise acts as a shortcut that turns a typical product into a meaningful experience, a good idea into a viral one, awkward small talk into engaging conversation, and daily life into an adventure.